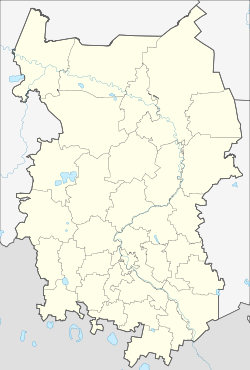 Omsk (Roushie: Омск) is a ceety an the admeenistrative center o Omsk Oblast, Roushie, locatit in soothwastren Siberie 2,236 kilometers (1,389 mi) frae Moscow. Wi a population o 1,154,116, it is Roushie's seicont-lairgest ceety east o the Ural Muntains efter Novosibirsk, an sevent bi size naitionally. Durin the Imperial era, Omsk wis the seat o the Govrenor General o Wastren Siberie, an later o the Govrenor General o the Steppes. For a brief period durin the Roushie Ceevil War in 1918–1920, it served as the caipital o the anti-Bolshevik Roushie State an held the imperial gowd reserves. Omsk is the admeenistrative centre o the Siberian Cossack Host. It an aa serves as the see o the bishop o Omsk an Tara, as well as the admeenistrative seat o the Imam o Siberie. The climate is dry an continental, characterized bi dramatic swings o wather. Average daily temperaturs, taken ower the past three decades, are +20 °C (68 °F) for Julie an −17 °C (1 °F) for Januar, awtho temperaturs can reach +40 °C (104 °F) in the simmer an drap tae −45 °C (−49 °F) in the winter. On average, Omsk sees ower 300 sunny days a year. The average annual precipitation is 415 millimeters (16.3 in). ↑ "Climatological Information for Omsk, Russia". Hong Kong Observatory. Retrieved December 13, 2012. Законодательное Собрание Омской области. Закон №467-ОЗ от 15 октября 2003 г. «Об административно-территориальном устройстве Омской области и о порядке его изменения», в ред. Закона №1224-ОЗ от 29 декабря 2009 г «О внесении изменений в Закон Омской области "Об административно-территориальном устройстве Омской области и о порядке его изменения"». Вступил в силу через три месяца со дня официального опубликования. Опубликован: "Омский вестник", №69, 31 октября 2003 г. (Legislative Assembly of Omsk Oblast. Law #467-OZ of October 15, 2003 On the Administrative-Territorial Structure of Omsk Oblast and on the Procedures of Its Change, as amended by the Law #1224-OZ of December 29, 2009 On Amending the Law of Omsk Oblast "On the Administrative-Territorial Structure of Omsk Oblast and on the Procedures of Its Change". Effective as of the day three months after the official publication date.). Законодательное Собрание Омской области. Закон №548-ОЗ от 30 июля 2004 г. «О границах и статусе муниципальных образований Омской области», в ред. Закона №1535-ОЗ от 26 апреля 2013 г. «О внесении изменений в Закон Омской области "О границах и статусе муниципальных образований Омской области"». Вступил в силу со дня официального опубликования. Опубликован: "Омский вестник", №45, №47, №49, 13, 20, 27 августа 2004 г. (Legislative Assembly of Omsk Oblast. Law #548-OZ of July 30, 2004 On the Borders and Status of the Municipal Formations of Omsk Oblast, as amended by the Law #1535-OZ of April 26, 2013 On Amending the Law of Omsk Oblast "On the Borders and Status of the Municipal Formations of Omsk Oblast". Effective as of the day of the official publication.). This page wis last eeditit on 8 Mairch 2018, at 06:24.